With my twenty-fifth birthday just around the corner a few friends began asking if there was anything I wanted. My standard answer is usually - "to have you come to dinner with me" or "a bottle of champagne". The other night though, I sat down and started thinking about a few things that would be useful or fun to add to my wardrobe/home. I'm so fortunate to have everything I need and wonderful friends, so I decided that this would be appropriately titled the "lust list". Items that are still useful, but also a bit fun. LOVE those birks! 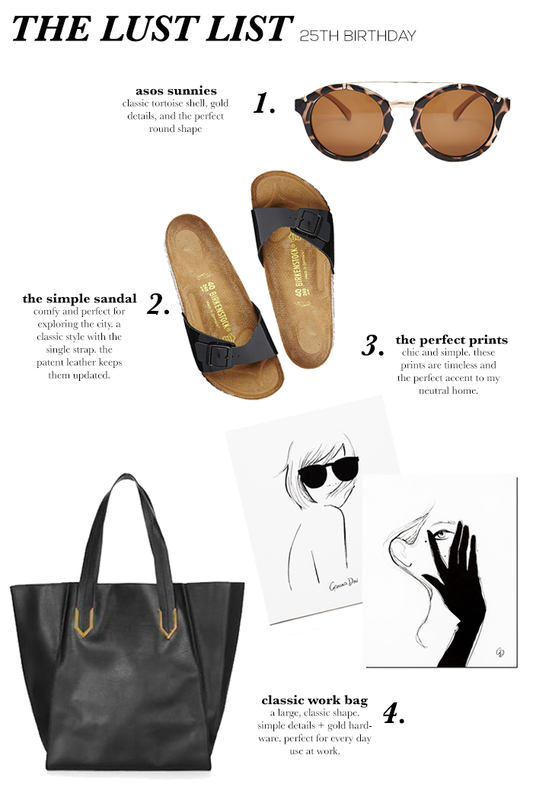 I've been on a trend of keeping things comfy on my feet now that I have a further walk to work (i.e slip ons, sneakers, etc) but I definitely want to invest in a pair of simple sandals for when it's REAL hot out. Can't wait to celebrate your big day!!! What a great roundup! I can totally see you wearing/displaying these Lust List items at home! I wanted Birks all last summer and never got a pair so I think it's truly justified to get them now that I'm still lusting after them for a second summer!! I'll text ya soon :) I've been working on plans for that weekend! Thanks Jordan! Can't wait to see you in a few weekends! I just bought that bag the other week! It's going to be such a lifesaver for travelling in summer, I can already tell.